The shares of seven publicly held newspaper companies today plunged to the lowest point in modern history in perhaps the worst single trading day ever for the industry. McClatchy (MNI), Lee Enterprises (LEE), and GateHouse Media (GHS) hit all-time lows when their shares skidded respectively to $4.85, $3.11 and $1.55 in the opening hours of trading on the New York Stock Exchange. :: Gannett (GCI) at $17.42, the lowest point since 1990.
:: Media General (MEG) at $10.34, the lowest point since 1994.
:: New York Times Co. (NYT) at $13.03, the lowest point since 1996.
:: News Corp. (NWS) at $14.20, the lowest point in 52 weeks. After scraping the bottom early in the day, the newspaper issues recovered by the end of trading to close at something higher than their record morning lows. However, the group has lost $3 billion of value since the first of this month (not counting the $6.3 billion reduction in the value of Scripps [SSP] occasioned by its spinoff on July 1 as a standalone newspaper company). The biggest losers on a percentage basis since the first of this month were GateHouse, whose shares fell 55.7%, and McClatchy, whose stock slid 33.2%. Double-digit drops were suffered in the period by Gannett, Journal Register (JRCO), Lee, Media General, New York Times and Sun-Times Media (SUTM). 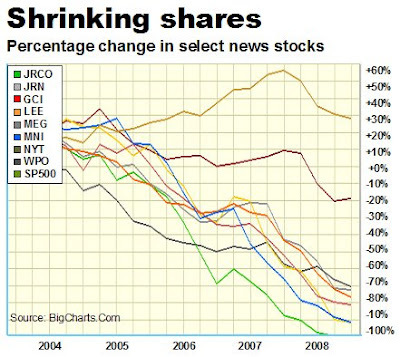 "Gannett is still doing OK (comparatively speaking)" Compared to what? Enron? Perhaps Tyco? GCI has collapsed from 90 in 2004 to $17 today. I don't hear much about layoffs at British newspapers these days (except that silly Echo venture GCI is now mired in), and Russian presses or Japanese presses are still humming. I haven't seen GCI singled out for much approbation, although it certainly deserves to be heaped on. As for management failures, at least foreign management seems to have an idea how to please their subscribers. England's Guardian is thriving in this period, as are Sir Rupert's properties. Instead of counting for the tide to come back in, maybe it is time to look for a lifeboat and find a model that works to get out of this morass. What would Tribune stock be today? "Maybe, just maybe, it's not just bad management at the highest levels ..."
Except it is. Years from now, textbooks will feature today's clueless newspaper managers as examples of what not to do. Face it: Newspaper execs have been terrible across the board: bad policies, bad hiring, bad treatment of employees, flat-out violations of employment law if anyone cared, etc. The list would go on and on and on. But thanks for checking in, Craig. These companies ought to be private, no? If further evidence of Gannett's truly dumb and dumber management, Gannett Blog is reporting GCI is planning to hike newspaper prices at 20 local papers from 50 cents to 75 cents next month. August and September are months the ABC uses for its annual circulation audit. The September results are the key determinant of ad rates for the next year, and whether national ads will be allocated to them. So what will happen when newspaper prices are hiked a quarter next month? Yes circulation DECLINES. Hello, GCI management: why not hold off the increases until October -- i.e. after the ABC audit? Then, let us look at the brilliant GCI management decision to establish a foreign colony in the UK, buying up local and regional papers with a large presence in northern England and Scotland. Have you driven through there recently? This is a region of pretty English villages populated disproportionately by elderly pensioners because young people have fled south to the cities looking for jobs. The coal mines and steel mills are shuttered, as are Scotland's shipbuilders. GCI is losing its shirt on these "investments," as you will certainly find out this month when GCI unveils its 2nd quarter results. I could provide more great GCI management decisions, if you would like to hear them. Why would anyone invest in a 2 class stock company, where management makes all decisions regardless of ownership percentage? Maybe my eyes are a little blurry this Saturday morning, but I'm having a problem with the chart you posted. I gather that you are trying to tell us that a lot of those companies lost a percentage of their stock prices over the past couple of years. Shouldn't the start point for all the companies you follw be zero? And if one of those companies hits 100% doesn't that mean that its stock price is also zero? SP500 somehow manages to even dip below 100%. (BTW, what's up with that 10% slipped between 80% and 100%?) Does that mean they will give you money to take the stock (or index) off their hands? "These companies ought to be private, no?" They should. But then we get nutcases like Sam Zell. "I could provide more great GCI management decisions, if you would like to hear them." Go for it. Is it a 5-book set? Again, more outstanding analysis from the Newsosaur. As the Gannett-loving anonymous above makes clear, the crisis in newspapers is actually much worse than most of the people working in newsrooms seem to understand. For many of these companies, basically almost all the value of their stocks have been wiped out. And sure, the economy is lousy and others are in tough times. But the only industries that are sucking this much wind are the Countrywides and the Big 3 automakers - poster children for epic mismanagement that will be studied by generations of MBA students. And in every case, it seems the answer of the dinosaur news organizations is to cut staff, cut pages, do a bit of redesign and basically keep cranking out the same product as before - i.e. keep doing the same thing, but just not as well. I think this is a positive step. Journalists have moaned for years about demands for excessive profits driven by stock values that had those profit demands built in. When the family publishers cashed out, entirely or partially, by selling public shares, the investors paid huge to get a share of those monster profits. The current crop of investors is taking a bath. But the outcome can be stock values that no longer necessitate outrageous profits. Yes, I know lower stock values open up other problems, such as raiding and difficulty raising capital. But stockvalues have to come down for us to reach a stable environment with lower profit expectations. Sorry I'm anonymous but I'm just throwing this out there for discussion and not trying to make it about my employer. Top 10 reasons newspapers are in this mess. 1. "We're the NEWSPAPER, no one is as important as us." 2. Being a monopoly for 150 years can make you lazy. 3. "Two people in our online department should be plenty"
4. Moving at "newspaper speed". 5. "Oh crap, no one's buying classified ads anymore? quick lets shrink the typeface, narrow the columns, raise our rates, and give away the online business to Yahoo!" 6. Old white guys in charge who are two years away from retirement trying to 'hold on' until they can check out and leave the mess for someone else to figure out. 10. Elitist attitude: "Nobody can produce the kind of news coverage we can." Who would raid one of these companies? JRC, for example, was recently at 18 cents a share. But the company's debt is likely higher, if not far higher, than the value of the entire company. "poster children for epic mismanagement that will be studied by generations of MBA students." Those would be today's clueless newspaper execs, whose only strategy seemed to be redesigning, claiming that approach worked, and then hiring only fools who bought into their moronic strategies. That description also would include dim bulbs like Dean Singleton, who is a weak link of humanity. We don't need leaders who have no clue and then try to blame all the employees for the problems. If journalism were armed conflict, Singleton would have earned "war criminal" status a long time ago. Newspapers are doing fine... where are we headed and what is this hand basket for? If it wasn't for a huge jump in foreclosure ads many newspapers would have already closed down. Would you like to pay for an ad? Who the heck is Craig? How close to default is your paper?